AutoZone Park is beginning to turn into Memphis’ version of what I imagine ESPN’s company cafeteria looks like. We don’t have Stuart Scott roaming around or anything, but these days you never really know what sports star is going to be at the ballpark. 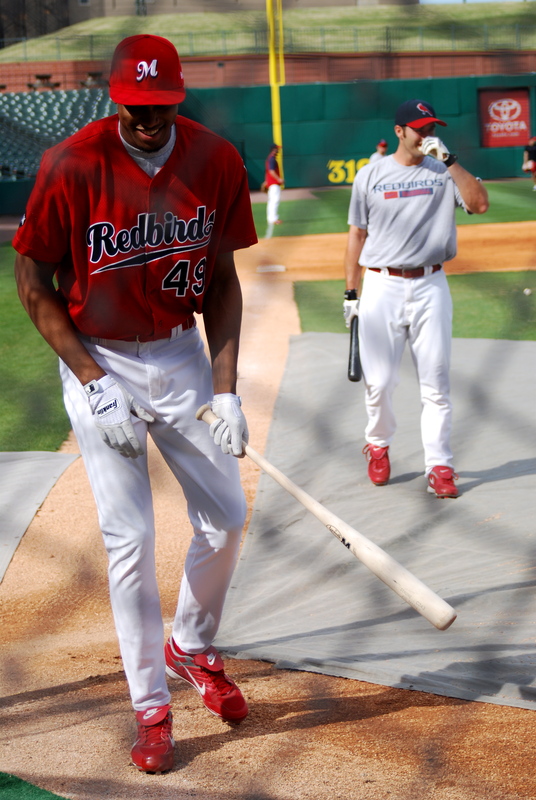 In the same weekend that brought all-time saves leader Trevor Hoffman to Memphis to face the ‘Birds as a member of the Sounds, Memphis was lucky enough to have Grizzlies star Rudy Gay show up Friday to take some swings during the team’s batting practice session. 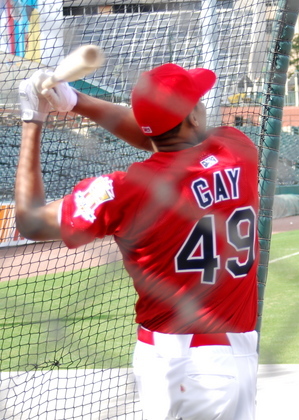 Gay’s appearance was spurred on by a bet he made with his cousin over whether he could hit a homer. The basketball star, of course, thought it would not be a problem, while his cousin pretty much held on to the belief that Gay should stick to what he knows. After a couple of healthy whiffs, Gay made some solid contact and proved his athletic career might not be relegated to just putting balls in baskets. Turns out he’s pretty good at belting them over fences, too. The Grizzly sent one soaring into the bluff a la Albert Pujols and showed his athleticism stretches well beyond the hardwood. In following with how most of us would act if we could do the same thing, he proudly trotted across the bases explaining to everyone that he did, in fact, just hit a home run. The guy seemed pretty great. Gay mingled with the team and generally soaked up the ballpark vibe like everyone else, just from a higher altitude. Rudy Gay steps out of the dugout for the first time, revealing his personalized jersey. 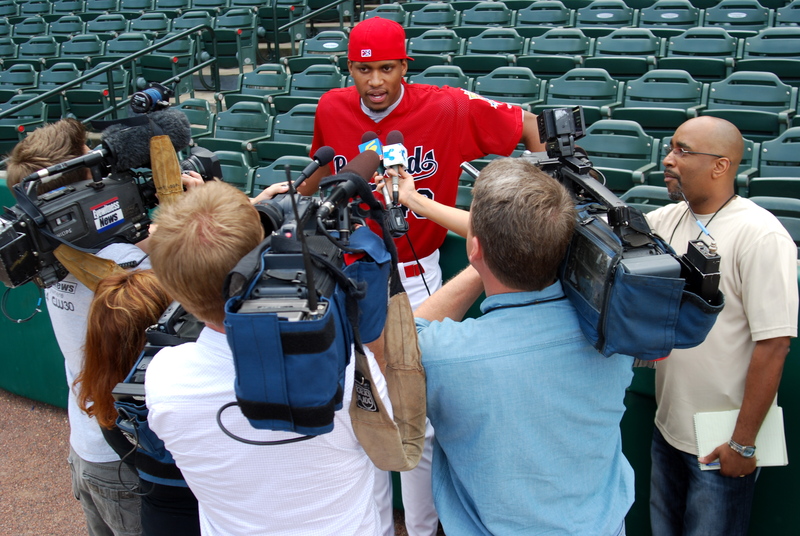 The temporary Redbird meets with the press prior to practice. Gay steps up to the plate, hitting in a rotation with Joe Mather and Matt Pagnozzi. Rudy Gay talking with Bryan Anderson about finding some batting gloves. (.439), RBI (15) and OBP (.510), to AZP. The ‘Birds posted a 10-6 record against Nashville last season. 4-4 at AZP. pitching in his 12th career start tonight? His 1,023rd game as a pro. He is expected to pitch in relief later in the series. Compared to the ‘Birds last meeting with the ‘Hawks, Memphis’ run average went from 2.33 to 3.25, but still the team struggled at the plate, averaging 6.5 hits per game. To be fair though, going into the series OKC had the best collective ERA of PCL teams with 2.83. New Redbirds pitchers debuted. Brad Thompson got a W, while Josh Kinney struggled in his .2 innings. Maekawa shook off the woes of his first start with a scoreless four innings. Shane Robinson’s eight-game hit streak was concluded on Monday night. OF Brian Barton was traded to the Braves for reliever Blaine Boyer. Boyer went to STL, sending David Freese to Memphis. 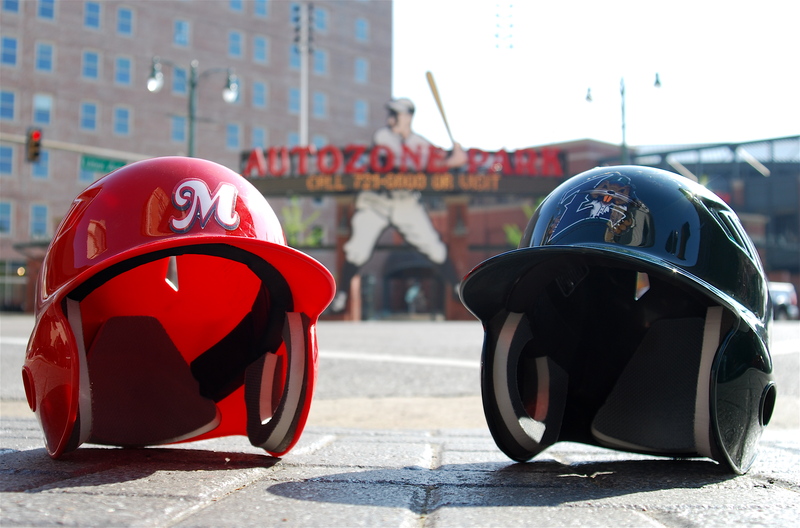 Look for Memphis Redbirds on twitter! Instant updates, game scores and free stuff. The Redbirds can hit! The OKC series brought a unimpressive 2.33 runs per game average / 6.67 hits per game average from the ‘Birds. But the NOLA series greatly improved both averages to 5.75 runs / 9.25 hits. Shane Robinson continues to have a hit in each game he has started (for a six-game streak) and leads the team in the category with 11. Allen Craig and Nick Stavinoha are on five-game hit streaks. The ‘Birds saw 6.1 innings against two lefties this series to make it 7.1 innings and 27 at-bats on the year. New Orleans’ John Koronka and Willie Collazo allowed five hits and two earned runs, fanning five Redbirds. Brian Barton and Allen Craig were responsible for four of those five hits (both have a .667 average versus lefties). The team totals a .185 average against southpaws. From 2.12 ERA to 3.23 ERA during the series, a lot of that has to do with Maekawa’s 9-3 loss in place of Mitchell Boggs. The team still ranks 3rd in the PCL for the category. Aside from a productive outing by Clayton Mortensen, the ‘Birds starters looked a little dicey in the four-game series. A consistent theme has been falling behind early, with runs coming in the first inning in each game of the series’ four games. Blake Hawksworth and Clayton Mortensen each picked up wins against the Zephyrs in their first starts of the season. Mortensen went five innings in his debut Tuesday night, giving up a run on two hits. Hawksworth overcame some early struggles in the first to post a solid five innings of work, allowing two earned runs with two walks and six strikeouts. Adam Ottavino got the nod in the series final in his second start of the season and struggled through four innings of work. He finished the day allowing five hits and three earned runs. Obviously, the state of the rotation is going to be flux with both P.J. Walters and Boggs now wearing Cardinals unifroms, so it should be interesting to see who all takes the mound in the coming days. If the’Birds can level the ship a little faster and not put themselves in bad situations early, they can improve on a fairly consistent first seven games. The bullpen was called in to chew up some crucial innings against the Zephyrs in each of the teams’ match-ups. In total, the ‘Birds gang of relievers came in for 16 innings, giving up three earned runs. Recalls by St. Louis hit the relief staff as well, with saves-leader Chris Perez making the move up to the big leagues. In his absecence, the ‘Birds are left with a revolving door of closers. Most recently, Jess Todd earned a save after two shutout innings in the eighth and ninth Thursday. Other notables from the series include Royce Ring’s return to the mound aftering beginning the season on the disabled list, posting a one-hit appearance Thurdsday. Left-hander Charlie Manning notched three innings against the Zephyrs, giving up two hits over three innings. Marco Gonzalez and Ian Ostlund each made two-inning appearances in the series, with both giving up one run. Heading in to Oklahoma City is kind of like starting over for the ‘Birds. The new pitchers will now have their chance at winning the series against the same OKC against which the ‘Birds original five went 2-1. Also, offensively we will see if the increased amount of hits is a product of the ‘Birds adjustments or a loose NOLA pitching squad. Once every few decades there comes an event so monumental, so earth-shattering that it turns society on its ear, changing the world in a way few could ever predict. Last night, AutoZone Park played host to what turned out to be the greatest sports spectacle the Bluff City has probably ever seen. 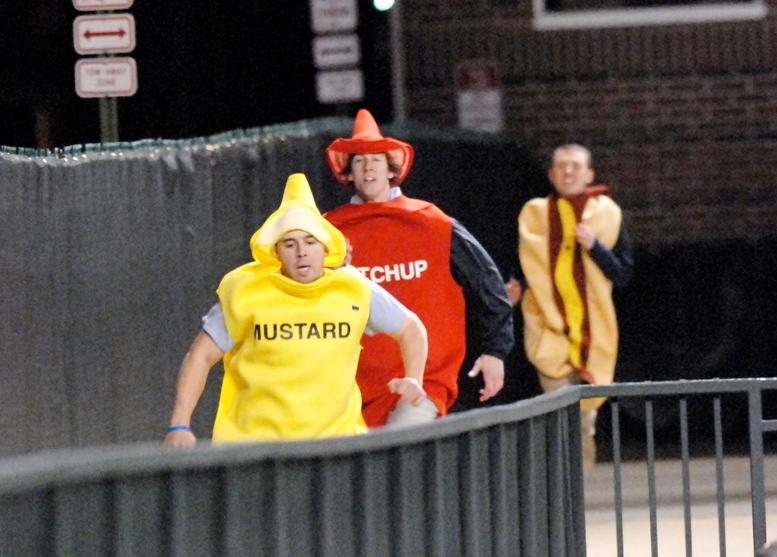 Dubbed the “War of the Weiner,” the best hot dog race in promotions history was held and those fortunate few able to witness its majesty will never be the same. At the commandment of our superior, Alex and I, along with fellow intern Phil Simon, were pitted against one another in the Redbirds legendary hot dog race. From the beginning, the stakes were high; respect was on the line. enthusiasts, but whatever, on to the race. The race started tame enough. Each racer was introduced, with Phil as Megan Mustard, Alex as Katy Ketchup and myself as Heather Hot Dog, and we all lined up in our race positions. Then, in a blur of both nerves and fear, the command came and we were off. With Phil taking the early lead, we barreled down the initial decline, bolted left and headed toward the center field bushes. I was gunning with Phil for the top spot while Alex “The Asthma Avenger” Wassel was bringing up the rear, when the unthinkable happened. In what played out as a slow motion tragedy, I fell to the ground going into the race’s final straightaway at the hands of a freak ankle injury, forced to watch as Phil sped on to sure victory. Bloodied and bruised, I managed to stay on the ground long enough to see my so-called “communications brother” and friend hurdle over my obviously lifeless, gnarled body and dash toward the finish line. I got up to the echoes of the PA announcer broadcasting my collapse and tried to salvage what little self-respect was left. At that point I was reserved to being the Jamaican bobsled team of hot dog racing, minus one John Candy. There was no chance of pulling out the win and the best I could hope for was to serve as an inspiration to those in the crowd. 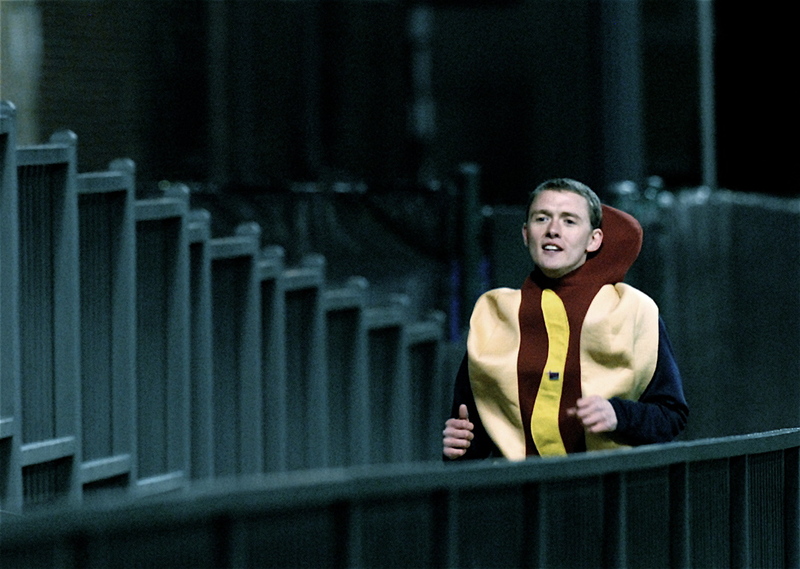 Listen, we’ve all fallen at some point in our lives, and I just wanted to be a wiener-clad beacon of hope for all those out there who thought it was impossible to get back up again. You’re welcome, Memphis. Consider yourself inspired. Alex here. It’s clear Phil pulled a quick one on us with his little Clark Kent maneuver, but I’ll let him battle with those demons on his own. The race went on. And apart from the aforementioned wrongdoing, two things prevented me from winning. 1) The Starting Gate – Before the race started Phil and I ‘Paper, Rock, Scissored’ for the outside lane. He beat me 2-0 to stick me in the middle. A bad place to be, considering what was about to happen. Knowing I’m not quick out of the gate, I decided to trail the pack in order to avoid the bumping and conserve energy for the final stretch. That’s when it happened. you Allison Rhoades for providing the pictures below. Race contestants Megan Mustard, Katy Ketchup and Heather Hot Dog at 130 meters. 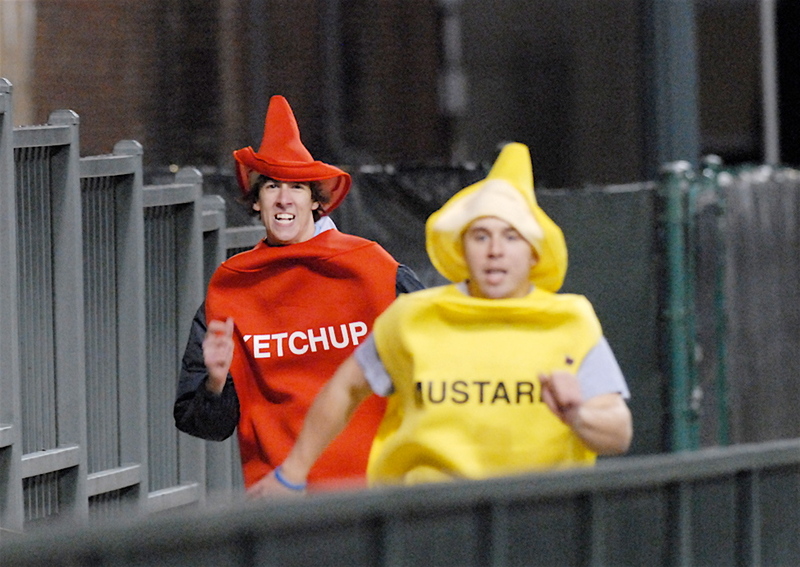 Katy Ketchup and Megan Mustard sprint to the finish. Alone after the crash, Heather Hot Dog displays painful determination, finishing the race. It’s never too early to start evaluating, so with three games down let’s take a look back at the ‘Birds series with the Oklahoma City RedHawks. Center-fielder Shane Robinson has come out strong, posting a hit in each game of the series and leading the team in hits with six. All of the ‘Birds regular starters have recorded a hit, but have been fairly quiet at the plate, averaging 6.67 hits a game, not helping the run production of 2.3 runs per game. With 2008 sluggers Nick Stavinoha and Joe Mather not getting a hit until Saturday night, the offense just has not been able to find its groove. No. 1 Neftali Feliz pitched four scoreless innings against the ‘Birds. He walked a ton of people, but looked pretty great doing. Those balls were crossing the plate at a lethal speed. No. 2 Derek Holland was scheduled to start on Sunday’s game, but the rain helped the ‘Birds dodge those left-handed bullets. Avoiding Holland, the ‘Birds only faced one inning of left-handed pitching. Gabbard came in on Friday to deliver a HBP on Jay and a walk to Mather before being relieved. Quite the different story on Saturday, when Ballard came in to pitch a hitless inning. Still, the LHP remains an untested facet of the game for the ‘Birds thus far. 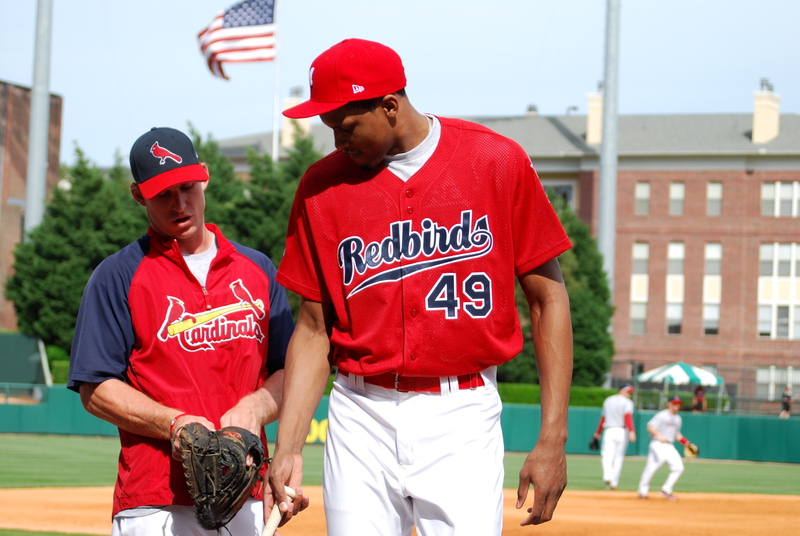 The Redbirds have a certain standard to live up to this season after leading the PCL with a 4.34 ERA in 2008. So far so good, we thinks. Adam Ottavino might have collected the loss in his first taste of Triple-A action, but he put together a fairly solid performance in his Redbird debut Friday night. The right-hander allowed just one earned in a little over five innings of work, issuing three walks and fanning five. P.J. Walters absolutely dominated in his first start of the year, with a seven-inning performance that saw the pitcher not allow a single RedHawk on base until he issued a walk in the top of the fourth and was hitless through five and two-thirds innings of work. If he stays on this kind of pace, opposing batters are going to be in for a long season. Right-hander Chris Perez was the star of the bullpen over the weekend, adding a save Saturday to a resume that already included a win he collected the previous Thursday. In his two appearances over the weekend, Perez posted three shut-out innings with three strikeouts and two walks. Each of his two outings came when the game was within a run, which shows he’s a go-to-guy in tight spots. Jess Todd was another member of the ‘Birds staff that had a couple of appearances over the weekend. His first came Thursday night in relief for Mitchell Boggs when Memphis was clinging to a one-run lead going into the seventh. He started off with a 1-2-3 seventh, but struggled some in the eighth and let the lead slip away when the ‘Hawks drove in two runs at the top of the inning. His appearance Saturday went a little smoother, as the right-hander went one inning without any Oklahoma City batters getting on base. If the last couple of games are any indication, Todd should be capable of chewing up some crucial middle innings when getting the call from the bullpen this season. With a solid starting rotation (still yet to see Hawksworth and Mortenson) and a few choice closers, the pitchers look to be a strong part of the team. Probably an A for starters and a B+ for relief. However, it’s the offense that is the biggest question mark. Where are our heavy-hitters? Giving the team a C for hitting is still probably generous. Average it together and there you have a B-. The only difference in the line-up tonight is Matt Pagnozzi at catcher, replacing Bryan Anderson who went 1-for-3 with a score in Thursday’s game. Starting pitchers Adam Ottavino (MEM) and Neftali Feliz (OKC) will make their Triple-A debuts tonight. The last time the Redbirds started the season 2-0 was in 2005, winning the series versus Oklahoma 3-1. The Redbirds have a 4-7 Opening Day record. The ‘Birds are 4-3 when hosting Opening Day in Memphis (3-3 at AZP). The past four openers have been against Oklahoma City, the ‘Hawks have won the previous three. The Redbirds last win on Opening Day was in 2005 (1-0 win vs. OKC). Mather went two-for-four on Opening Day last season with a double, triple and one run. Hoffpauir went two-for-three in last season’s Home Opener, scoring one run. The ‘Birds landed a 9-7 record versus Oklahoma City in 2008, 5-3 at home. We took an in-office poll, and last weekend was voted as pretty great. 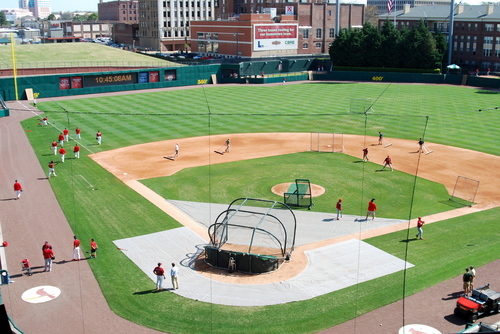 Last weekend’s exhibition games against the St. Louis Cardinals was significant in that it issued in the Redbirds first taste of baseball in AutoZone Park of 2009, but it was special for other reasons as well. Primarily, it introduced two vulnerable, naive youths named Ben and Alex to the tumultuous, tenacious world of professional baseball. We did manage to have some fairly great experiences. In a weekend certainly filled with more highs than lows, the two of us are pleased to announce some of our personal highlights and not-so-highlights of the weekend. 1. Getting quotes in the Cardinals clubhouse – My first brush with a major league clubhouse was an absolutely surreal mix of stonewashed denim, tattoos and Rambo. Everyone was extremely personable and answered questions, which was great for a guy who was unbelievably nervous about the whole thing. Awesome. 2. Albert Pujols’ monster performance over the weekend – On Friday night alone, he posted a 3-for-5 outing with a homer and six RBI. He definitely put on the performance everyone wanted to see over the weekend. Super awesome. 3. Jose Oquendo – The Cardinals third-base coach and all-around legend decided to get in an at-bat in Saturday’s exhibition game, earning the walk and eventually making it all the way to third base. Baseball dreams do come true. Undeniably awesome. Tripping in the Redbirds radio booth – It’s hard to make friends with broadcasters when you misjudge steps and form-tackle trash cans live on-air. I can only assume the sound of clanging aluminum raises more questions than answers from the listeners’ perspective. Embarrassingly awesome. 1. The Cardinals Clubhouse – Finally getting experience interviewing professional athletes. Who better to break me in than Tony La Russa? I was fortunate enough to be in there with a few other interviewers, who knew what they were doing. Pretty cool. 2. 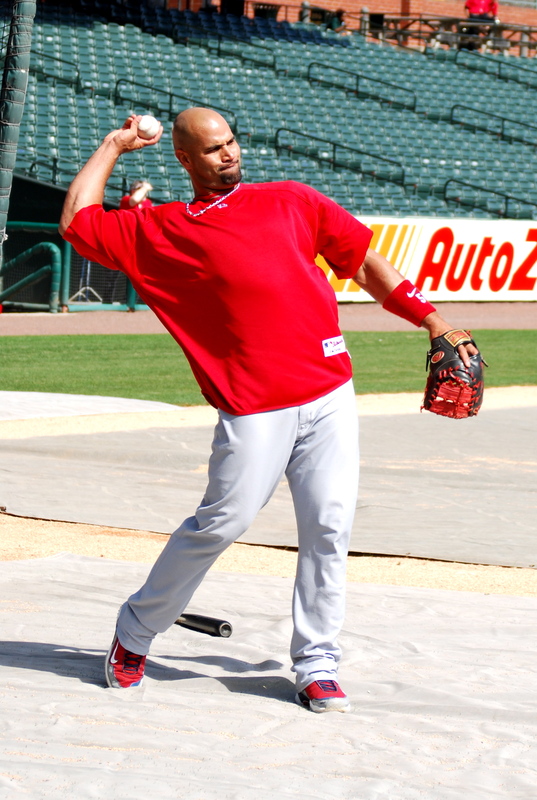 Getting stared down by Albert Pujols – I enjoy taking photos and I was granted access to the field during warm-ups. 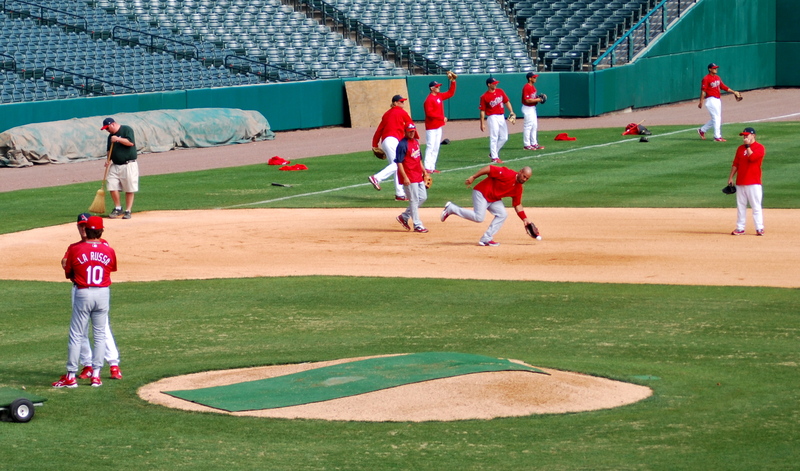 I was really close to Albert Pujols and started taking some photos. A few pictures in he turned his head and stared me down. It was evident he wasn’t going to back down so I turned and took pictures of the player he was throwing to. Really just being able to take photos on the field was a privilege. 3. Action in Press Box – I was finally able to see how it all works. From the FOX Sports truck to the delicious buffet, there were a lot of people running around and getting everything in order, including myself. There was a buzz in the air. I think everyone was ready for professional baseball in the AZP. Yellow – I never thought I’d be saying this about my favorite color, but wearing a pale yellow game day polo in a Cardinal-red dominated clubhouse certainly didn’t help me blend in. And for a rookie interviewer unsure who to interview, I have trouble believing that I didn’t stick out like a sore thumb. Still, the experience will not forget. This weekend was unquestionably phenomenal, but it’s only the tip of a giant, diamond-shaped iceberg. 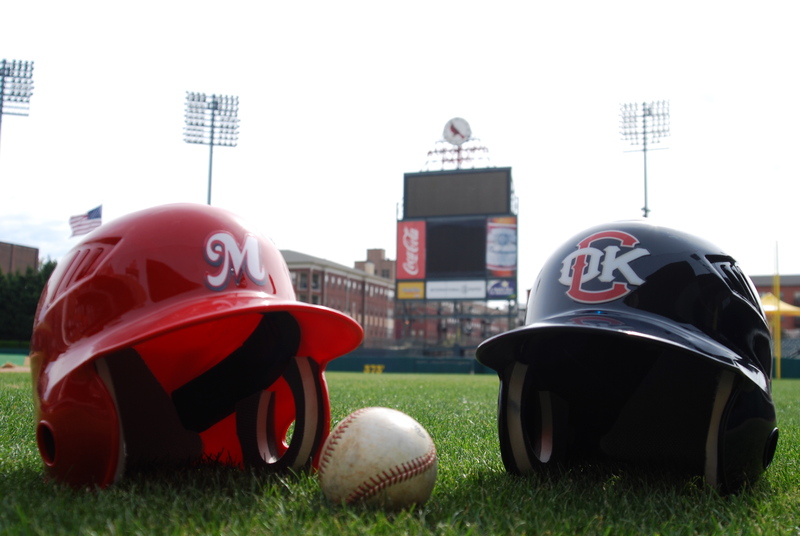 The Redbirds officially kick off their season Thursday, April 9, when they take on the Oklahoma City RedHawks, so expect the good times to keep rolling all summer long. All-in-all, we’re pretty pumped about some catching some Redbirds baseball this year. 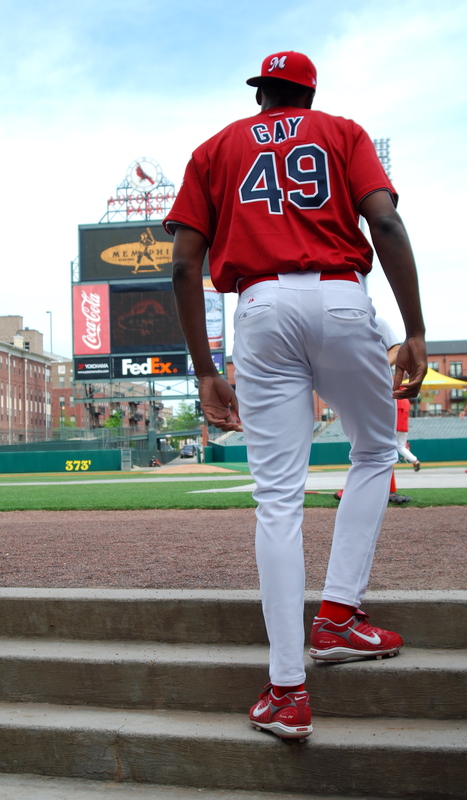 What a thrill it was to see the St. Louis Cardinals take the field this weekend at AutoZone Park. Albert Pujols and the gang were visitors to the Memphis Redbirds for a two-game series that took place on Friday and Saturday. The following photos are from Saturday, which turned out to be a perfect day for baseball. 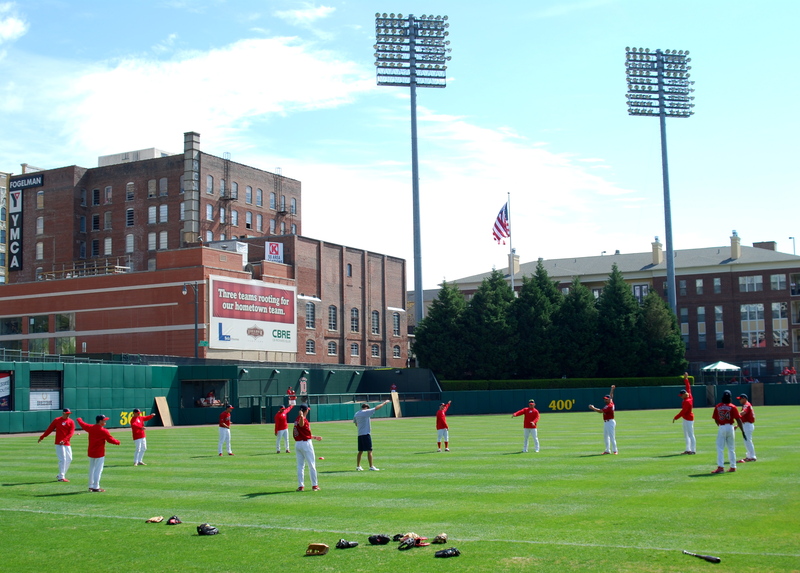 The Redbirds getting loose in left field during pregame warm-ups. Reigning National League MVP Albert Pujols had a killer day on Friday, going 3-for-5 and netting six RBI. He also hit a home run in Friday’s game and belted one over the Bluff in left field during batting practice on Saturday. 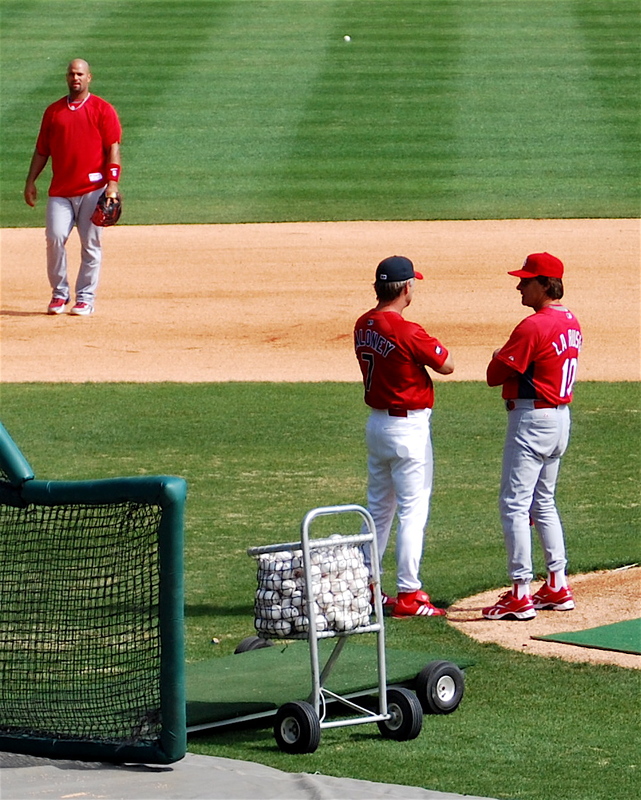 Managers Tony La Russa and Chris Maloney talk before the game. Maloney had the honor of taking the last at-bat on Saturday, producing a ground out off of Jason Motte. Tomorrow Ben and I will post the highs and lows of the weekend from our perspective in the press box and the clubhouse.